Sunrise From Mt. Fuji is a photograph by Morris Finkelstein which was uploaded on July 25th, 2016. 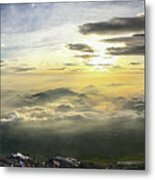 "We began our climb up Mt Fuji at 12:30am on July 2, just the second day of the official climbing season for the Yoshida Trail. We summited around 4:15am. A heavy fog had rolled in just as the sun was rising. Our view at the summit was obstructed for about 30 minutes before we decided to start our descent as the 60-70 mph gusts at the summit were starting to chill us to our cores. Around 5:00 the cloud cover and fog started to lift and what was left was nothing short of the most spectacular sunrise I have ever seen. We were struck by the blanket of clouds off to our right, which contrasted beautifully with the mountains and lakes off to our left. In total, just over 200,000 climbers ascend Fuji every year. Since the first day of the season happened to be a Friday, the route was very busy as we ascended, despite the pitch black conditions. I think a safe estimate would be 2,000 climbers during our ascent." Mt. Fuji is the highest mountain peak in Japan with an elevation of 12,389 feet. Mt. 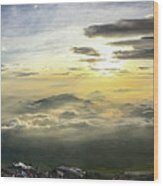 Fuji, also called "Fuji-san", is considered as a sacred place and as a place of inspiration for artists. Today, it is a prominent destination for tourism and for mountain climbing. 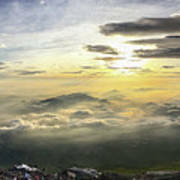 Paul's panoramic photograph of the sunrise as seen from the summit of Mt. Fuji was captured on 7-2-2016 with an iPhone 6 camera. Thank you Kristina from me and my son Paul!!! Thank you Cheryl. The climb to the summit of Mt. Fuji, and this view, were highlights of his trip to Japan. Thank you Stefano for featuring "Sunrise From Mt. Fuji" in your "10 Plus" group. Very much appreciated! Thank you Kay, on behalf of my son Paul! He captured this image from the summit of Mt. 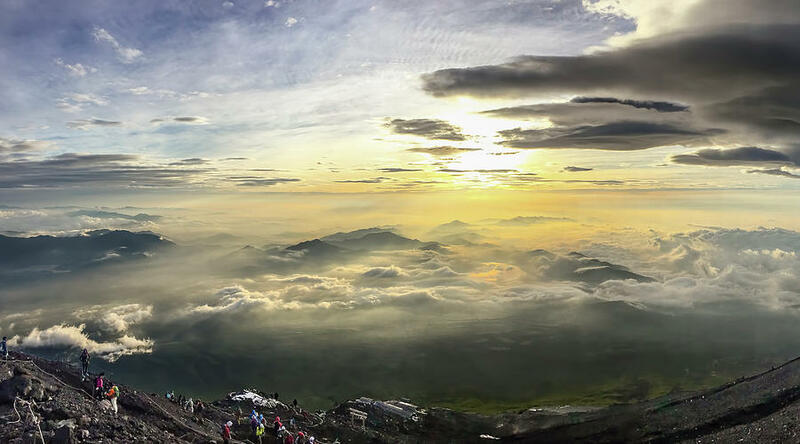 Fuji on his iPhone, after reaching the summit just before sunrise. Congratulations on your win for the Cloud Formations contest Morris!! Congratulations Morris! Your extraordinary image has won SECOND PRIZE for the Contest: "Cloud Formations - All Media Accepted". Out of 1,842 contestants, you have been given second billing - which is quite an accomplishment! Your prize winning image is being showcased on the homepage of the group: "Cloud Formations and Sky Activity - Day and Night - Including Clear Skies and Eternal Horizons" Group URL: http://fineartamerica.com/groups/cloud-formations-and-sky-activity--day-and-night--including-clear-skies-and-eternal-horizons-.html so that all visitors of the group will be able to click on your image and admire it in its full size, and comment on it, click like and favorite if they choose! Thank you for your participation in this outstanding contest! Thank you for recognizing this photograph for a Second Place in your contest "Cloud Formations - All Media Accepted". This is a big honor! Thank you Karen for featuring "Sunrise From Mt. Fuji" in your "Nature Landmarks Landscapes Wildlife" group. Very much appreciated! Thanks Donna! My son Paul made the climb. Thank you Will. My son Paul has great memories of this magnificent view, and other places that he visited, that will be with him for a long time. Hi Morris~~a magnificent view from Mt. Fuji in Japan photographed by your son, Paul..! Must have been an exhilarating climb- an outstanding image!! F&L&TwtΠn! !